The NSP now offers bike patrol and bike host member types. This means that if you are a bike patroller with an OEC card, you can join the NSP! If you take our Outdoor First Care (OFC) course, you can join the NSP as a bike host. Hosts serve in a variety of roles but are trained as first responders through the Outdoor First Care course. This required first aid course includes content knowledge and hands-on skills training. OFC only costs $25.00 and provides a two-year certification upon completion. Subsequent renewals of OFC may be completed at no additional charge. All Outdoor First Care courses are offered through host units or patrols and course schedules vary. Please contact the patrol or host unit you are interested in joining to learn more. The NSP offers these memberships in response to the evolving outdoor recreation industry. As ski areas start to operate year-round and offer various summer activities, the NSP is here to continue supporting lift-accessed areas as well as additional land management units, including urban parks and open space cycling. Whether you are in a ski area or at a non lift-accessed area, there are a variety of things to consider when establishing a bike patrol or host unit. The first step is to work with area management to determine the desired approach. Purpose: What is the need for a bike patrol or host unit? Skills patrollers need: NSP bike patrollers must obtain Outdoor Emergency Care certification. NSP bike hosts must obtain Outdoor First Care training. 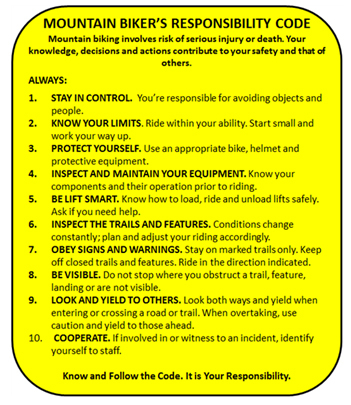 Roles and responsibilities of patrollers in bike park: It is important to discuss this with area management as you proceed with forming a patrol or host unit. Communication and safety: Do patrollers and hosts greet guests and serve as ambassadors? Do they distribute pamphlets or brochures and/or point out signage? Signage, closures: Visit the National Ski Area Association’s webpage for more information. Care and transportation: Extraction and care of the guest differ from the winter. Be aware that travel times tend to be longer and rougher. Train your patrol on summer transportation techniques. MOU or other agreement with your land area: You must have an agreement with the land area on which your bike patrol or host unit operates. If you are in a lift-accessed area, ski area management ultimately supervises and controls patrolling and host activities of individual NSP members, NSP patrols, and host programs at each ski area. If you are not in a lift-accessed area, the NSP can provide you examples of a Memorandum of Understanding or similar agreement with your local land area management. The bike patrol or host unit leader will reach out to the Lakewood office in Colorado by emailing the registration manager at memberrecords@nsp.org, or by calling the office at (303) 988-1111, ext. 2661. NSP Registration Manager Charles Buckman will send the bike patrol or host unit leader documentation regarding the IMBA/NSP transition. This document will break down the different types of membership the bike patrol or host unit can participate in. The bike patrol or host unit leader will respond to the registration manager via email with the decision if they would like to join as a bike patrol or bike host unit. The registration manager will respond with an attached application for a bike host unit or bike patrol. In this email, the registration manager will also include the division’s contact information based on the inquiring bike patrol or host unit geographic location. The bike patrol or host unit leader will reach out to the division director regarding how they can take either the Outdoor First Care (OFC) or Outdoor Emergency Care (OEC) course, as determined by whether they are forming a host unit or patrol, respectively. The leader will also take this opportunity to introduce themselves to the division and discuss dues and best practices. If the patrol or host unit does not already have trained OEC instructors as members, the division director will need to identify a process for the patrollers or hosts to obtain the proper training. The bike patrol or host unit leader will create an account on the www.nsp.orgwebsite. They will then fill out all fields of the application minus the section, region, and division signatures at the bottom. Once this is filled out, the leader will email or fax this application to the registration manager at the Lakewood office. If they have any questions, they can reach out to the Lakewood office at memberrecords@nsp.org. The registration manager will then forward this application to the division director for approval and signature. Once the division director approves the new bike patrol or host unit, the registration manager at the Lakewood office will create the bike patrol or Host Unit in the system. The registration manager will then communicate with the bike leader that the patrol or host unit has been created and how to proceed with payment so that they are able to manage their roster.